Home › Advice › What's the Difference Between Porcelain Tiles and Ceramic Tiles? Porcelain tiles are harder than ceramic tiles. Porcelain tiles are more suitable for areas of high traffic. Porcelain tiles absorb less moisture than ceramic tiles. Porcelain tiles are more likely to survive a frost; thus, most of them are suitable for use on outdoor patios. Ceramic tiles (which have a higher moisture content) will be subject to the forces of freeze / thaw on Winter nights if installed outside; thus, they will crack during a cold snap. Porcelain tiles are far less likely to crack or fail when installed over a wooden substrate, for example a tongue and groove floor, where there may be a lot of movement as people walk across the floor. Most porcelain tiles are made with floors in mind. However, all tiles can be used on walls, so it’s perfectly acceptable to use porcelain tiles on bathroom walls for example. This is often done with tiles that are rectangular, such as 30 x 60 cm sizes. Why are Porcelain and Ceramic Tiles Different? Porcelain tiles have extra compounds added to the clay during production, and are composed of finer, more refined sands such as kaolin clays, feldspars, and silica. The resulting mixture is denser and less porous than the clay used for ceramic tiles. Porcelain tiles are fired at a much higher temperature (about 1,300 degrees C) and at greater pressure during the production process. And often, they are fired for a longer period of time than ceramic. This removes almost all the natural water content. Leave a tile in a bucket of water for a day, and then weigh it. If the weight has increased by more than 0.5%, then it does not qualify as a porcelain tile. Note that in this example, the water is being absorbed by the body of the tile, and not through the top surface, as this is glazed and is practically impervious. Are All Porcelain Tiles the Same? Glazed porcelain tiles have had a glaze applied to the tile face. This glaze is a type of liquefied glass which has been baked onto the face of the tile in a kiln during the manufacturing process. The glaze is impervious. It will usually contain an artistic design or colour(s). The characteristics of the glaze are the same as those of a ceramic tile. The characteristics of the body (or “biscuit”) of the tile are the same as a through-body porcelain tile. Polished porcelain tiles start off life as unglazed porcelain tiles. An industrial scale buffer then polishes them to a high sheen. This produces a tile face with a highly reflective, mirror-like surface. But note that no glaze (liquefied glass coating) has been added. Are Ceramic and Porcelain Tiles Porous? Most ceramic tiles have a glaze on their top face. The glaze is similar to a liquid glass that has been fused onto the biscuit, and as you know with a glass window, water does not penetrate glass. The biscuit itself is porous (i.e. it can absorb water), but the biscuit would never be exposed to water in a practical application. Once installed correctly, and with grout (which is virtually impervious), glazed ceramic tiles are perfectly suited to bathroom applications. The biscuit of a porcelain tile, by comparison, absorbs virtually no water. If you hold a porcelain tile upside-down in your hand and pour water onto the back of it (the rear is not glazed), the water will simply run off it. The 1 minute video below from a US tile retailer gives a great demonstration of the difference between ceramic and porcelain tiles as regards porosity. A picture speaks a thousand words, and a video so many more! Thus, you may be surprised to read that it's also possible to get unglazed ceramic tiles. These are somewhat of a speciality, such as terracotta. As you can guess from the above information, they would have to be sealed prior to use, as their surface is porous. Are Porcelain Tiles Better than Ceramic Tiles? It all sounds like ceramic is an inferior product to porcelain. This is not true; it's simply a different product. Ceramic is usually significantly cheaper than porcelain. The raw materials, production costs, and transport costs (ceramic is lighter) are all lower. On average, porcelain is £3 - £5 more per square metre than ceramic. The Porcelain Enamel Institute rating (PEI rating) of tiles is a measure of how much wear and tear a tile can take. Group I: These tiles are suitable only for areas of very light traffic, where shoes are unlikely to be used, such as an upstairs’ ensuite. The surface of the tile could be easily marked or scratched by only a small amount of harsh treatment. Group II: Areas of the home which are not exposed to the highest levels of traffic, or not likely to come into contact with significant quantities of dirt or other abrasive materials. So the hall and kitchen would not qualify here, but a living room and bathroom would. Group III: Any residential area, or indeed some light commercial areas, where the presence of abrasive dirt etc. is not excessive. Group IV: Any residential area, commercial areas such as restaurants, exhibition areas, hotel rooms, showrooms, where there may be significant traffic. Group V: Substantial or very heavy traffic, such as shopping centres, commercial entrances, hotel lobbies, and industrial workplaces. Theses tile are generally more expensive than tiles in the other categories. Ceramic tiles tend to range from a score of PEI 0 (for use on walls only) to a score of PEI III or PEI IV. Porcelain tiles tend to be in the range PEI III - PEI V. In areas of heavy traffic, e.g. where children with muddy gritty boots, pets or commercial levels of traffic are expected, then the durability that is delivered by porcelain floors is the better choice. Full body or through-body porcelain (which has the same colour all the way through the tile) is particularly scratch resistant. By contrast, if the coloured glaze on a tile is chipped or scratched away, then the plain colour of the tile body would be visible underneath. But in any case, such damage would be highly unusual. On a bathroom wall, where there is no need for extra strength, a ceramic tile performs as well as its porcelain counterpart. Indeed, your tiler will be pleased when it comes to drilling holes to hang showers, mirrors, and accessories - it's far easier to drill through ceramic than porcelain. When tiling over a screed or smooth concrete floor at home, there is no difference between having ceramic or porcelain floor tiles. You should choose the design you prefer the most and go with it. For an upstairs bathroom floor, where it's more likely to receive regular shoes or slippers rather than football boots, a ceramic floor tile will be fine. If you're considering installing tiles yourself, the less dense ceramic will be much easier to cut using a wet tile saw or snap tile cutter. In fact, cutting porcelain would only be recommended for the more experienced DIY'er. 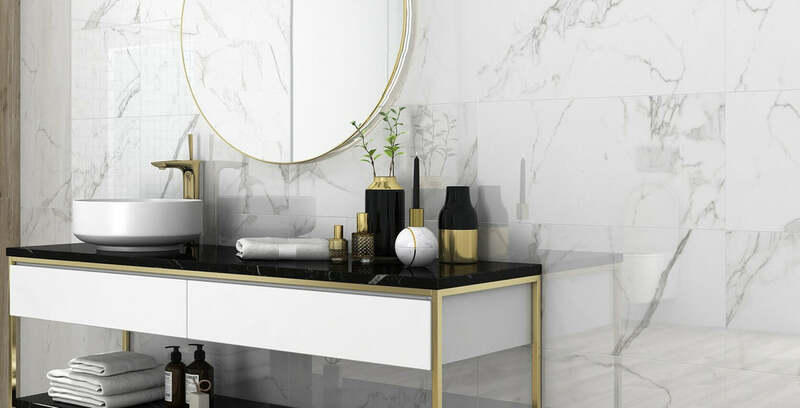 And even if a professional is installing tiles, ceramic might be the better choice if the tiles will not have to withstand heavy traffic, and the tiles have to be cut around a multitude of unusual shapes and corners during installation. Underfloor heating or hydronic heating coils can be used underneath both ceramic and porcelain tiles. Both ceramic and porcelain tiles can be rectified after production; although in practice, it is usually only porcelain tiles that are sold in a rectified form.